Once Pārvathi bowed respectfully to Lord Parameswara and asked. “Oh Lord! Could you please explain about the science and origin of music that gives transcendent bliss to all the creatures in this Universe ? ”. Lord said to his consort. Hey ! Pārvathi. Please listen carefully. I created the Panchabhoothās and the Saptaswarās that form the base of Sangeetha Sāsthra from my 5 faces. From the face Sadyojātham, the Swara Gandhāram (Ga) and the element Earth / Prithvi was created. From Prithvi, instruments like Drums or Avanadha Vadyam – Idaikka, Timila, Maddalam , Mridangam which uses animal skin evolved. From the face Vamadevam, the swara Dhaivatham (Dha) and the element Water / Ap was created. From Ap, instruments like Conch were created. From the face Aghoram, the swaras Shadjam & Rishabha (Sa and Ri) and the Fire / Thejassu element was created. From the Thejassu, Kaamsya Vaadyas or Gongs – chengila, ilatalam and kuzhitalam were produced. From the face Thathpurusham, the swara Panchamam and the element Air / Vāyu was created. From Vāyu, Randhra Vaadyas /Sushira Vaadya instruments like Pullaankuzhal (flute), Kombu etc were created. From the fifth face Eesaanam, the swaras Madhyamam and Nishadam and the element Ether / Akāsham were born. From Akāsham, Stringed instruments or Tata Vadyaas like Veena etc were born. Lord Shiva continues to Parvathi about the birth of these swara devathas on particular weekdays as per the following sloka. 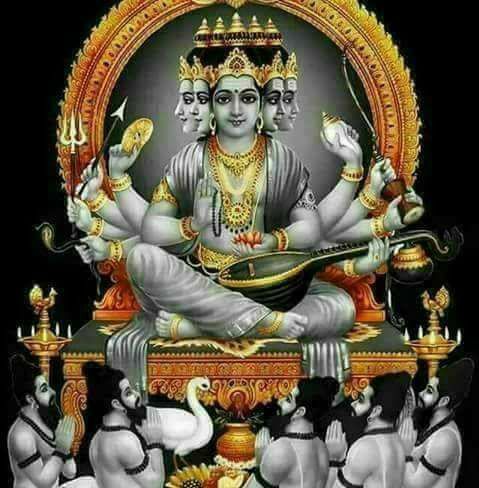 Great Rishis like Bharatha, Mathanga and the like learned this Sangeetha Sāsthra from Lord Shiva and spread it for the welfare of the entire universe. Saint Tyagaraja hints the origin of music in his krithis Nada Tanu manisam Sankaram in Raga Chittaranjani where he sings Sadyojaathadi Panchavakthraja SRGMPDN vara sapthaswara. Doing meditation or dhyaanam just once with a pure mind is equal to chanting a manthra one crore times. If you are able to unify yourself or enter the state of absolute laya or consciousness, it will be equal to doing dhyaanam a crore times. Singing sweetly just once in perfect alignment with sruthi and layam is equal to unifying yourself with the Absolute Self a crore times. There is nothing more superior than the divine music which leads to eternal happiness that bestows both Bhukthi (materialistic) and Mukthi (Salvation). #26-Swara Devathās- Sangeethothpaththi – Part 2. Extremely well written and educative. Carnatic Music is one of the path towards spiritual awakening. Thank you very much for this write-up. I have a query. Why is Carnatic Music referred as Gandharva Vidya? Thanks to clarify. It is common knowledge that music is born from Sama Veda, the saamans representing the earliest songs.According to Bharatha’s Natyasasstra, it was Brahma who created the Natya Veda, taking the art of effective speech from Rig Veda, Abhinaya from Yajur Veda, Gana or music from Sama Veda and Rasa from Adharva Veda. This became the fifth Veda and was named Natya Veda. After the period of Saman singing , we have the second period called Gandharva or Marga. Gandharva Vidya or Gandharva music is also Sama Sangeetham. Sapta swaras were already established in Sama Gaanam. Gandharvas were celestial musicians who were professional singers. Constituents of Gandharva Gaana are Swaram, Padam and Talam. This is what that’s being practiced today in the form of Carnatic Music. All these three constituents find place in the present day music also. In ancient time, it was referred to as Gandharva Vidya. Reading this blog itself is purifying and elevating. Thanks a ton for writing this! Madam, Great article. Pray that you write more and more on music to enlighten us.